Definition at line 43 of file rib.hpp. Definition at line 45 of file rib.hpp. Referenced by nfd::rib::ClientToNlsrReadvertisePolicy::handleNewRoute(), nfd::rib::HostToGatewayReadvertisePolicy::handleNewRoute(), and nfd::rib::operator<(). Definition at line 46 of file rib.hpp. 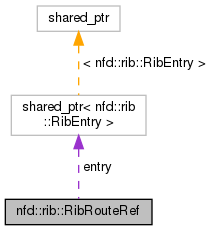 Referenced by nfd::rib::ClientToNlsrReadvertisePolicy::handleNewRoute(), and nfd::rib::operator<().